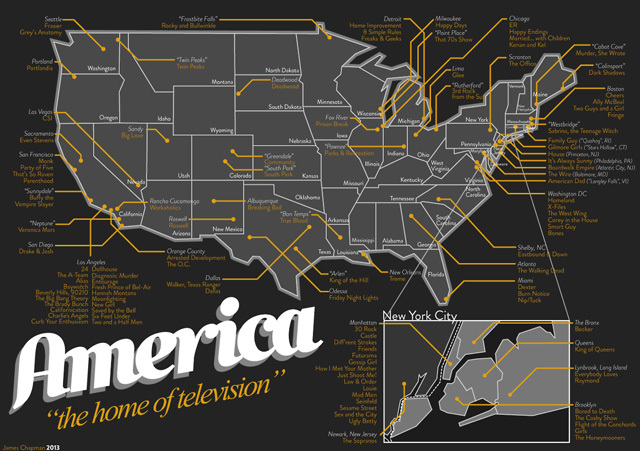 Graphic artist and physicist James Chapman has designed a detailed poster titled “AMERICA:the home of television” which is a map of television show locations in the United States. It’s available to purchase at his Etsy shop. Have you ever wondered how far it is from Breaking Bad to Arrested Development? Or which coast has more crime drama? Or how many shows are set in Wyoming? (Spoiler alert, it’s none) Well, wonder no more. Law & Order, Happy Days, Treme, Gossip Girl, Frasier, 30 Rock, Rocky & Bullwinkle, The Wire, Sabrina the Teenage Witch, Even Stevens, True Blood, Girls, Community, Friday Night Lights and many many many more. It looks great, you’ll impress your friends AAAAAND you might just learn something new about a show you like.